If Mexico is high on your bucket list, then Tulum should be a non-negotiable stop on your Mexican meanderings. Tulum is located on the Caribbean side and was carved out of the jungle less than 50 years ago, since becoming a popular hotspot with celebrities and fashion elite. 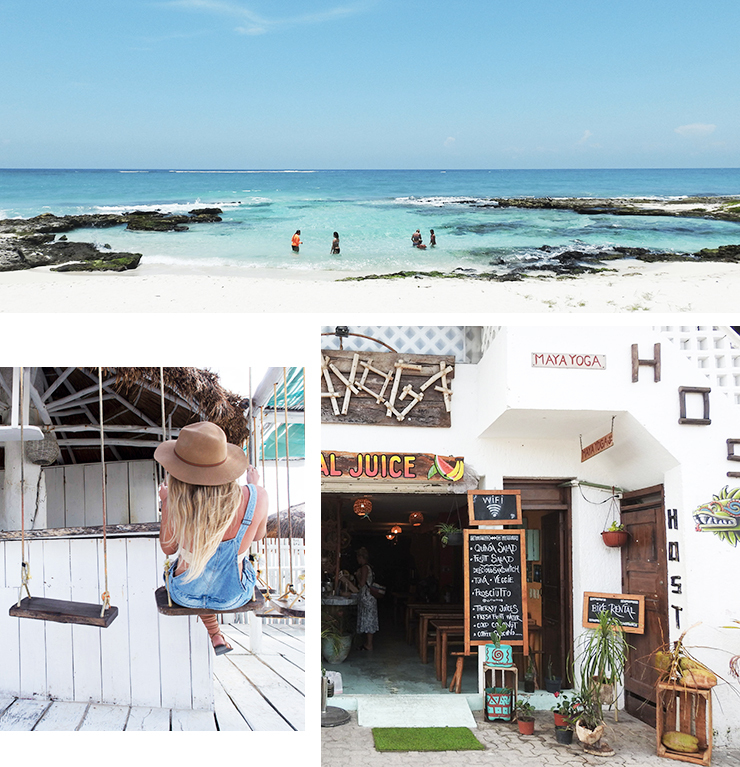 Tulum is like Gilligan’s Island, with the perfect balance for a vacay. Completely back to basics, yoga studios everywhere, lots of fresh and organic food fit for royalty and yet has bars on the beach blasting club music. You won’t see any high rise luxury resorts here, only eco-chic wood and thatch cabanas plonked right on the sand. Oh, and don’t expect rooms to have air conditioning or more than one power outlet, because Tulum is all about solar power. 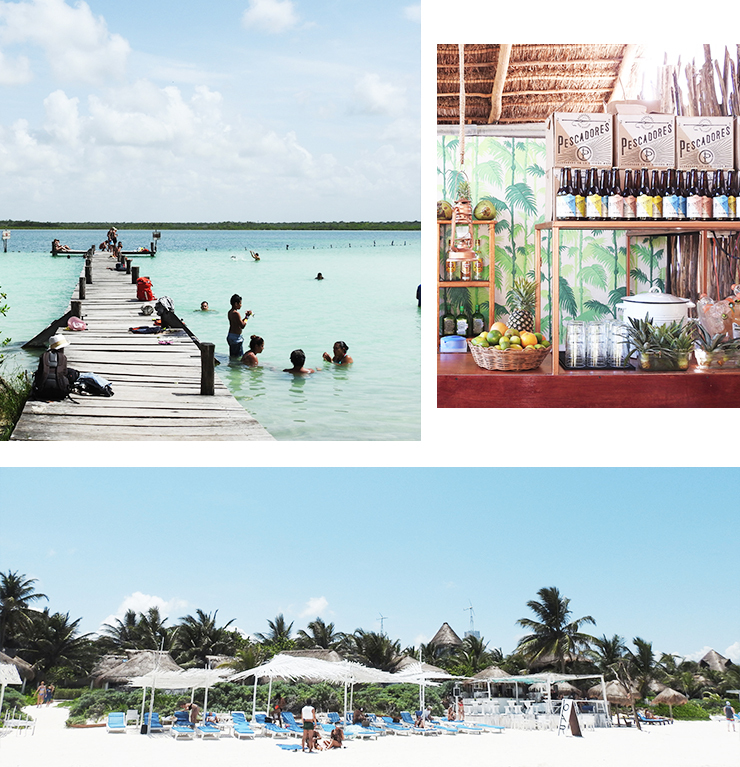 Here’s our guide to 48 hours in Tulum…If you misplaced your passport and had to stay a bit longer, we wouldn’t blame you. Hola, you have touched down in paradise! Arriving into Cancun Airport (the closest to Tulum) you can either rent your own car or get a driver to Tulum, which is about a two-hour drive away. Tulum is small enough to not have a car in, but it is handy if you want to venture into the main pueblo (town) or to the cenotes and ruins. Check into your accommodation (there are so many cool places to stay depending on your budget), get familiar with your room and the stunning surrounds and go for a dip in the Caribbean to wash away all the travel feels. Bedazzled you will be as you witness the whitest sand in the world with water as clear as a fishbowl lapping the shores. After your swim, try and locate a fresh coconut to hydrate from your plane ride. The first thing on your agenda should be a nice stroll down the Tulum hotel zone to get your bearings and to check out all the bohemian shops and restaurants. If you want to get a little zen, then head to Yaan Wellness; an energy healing spa which offers treetop yoga classes overlooking the jungle canopy. If you don’t have the energy, choose from their menu of massages. It’s about time your tummy will be rumbling, so we suggest heading to Hartwood restaurant, located on the jungle side of the street. You will need to make a reservation as this place always has a line cascading out the front door. Super sustainable, ingredients from local Mayan farms, a menu that changes daily and all cooking done by open fire, it’s no wonder Hartwood has made such a name for itself. If you can’t get in then your next best bet is the Italian at Posada Margherita. It’s situated right on the sand making it the perfect place to watch the sun go down, cocktail in hand. If history is high on your to-do list, then you should go to the Tulum Ruins as early as you can. They open at 8am, but get there by 7.50am before the hordes of tourists flock in around 9am. The ruins are what’s left of the only Mayan city built on the coast and with each one having a specific purpose; Tulum was no exception. Here it was a seaport trading in mainly turquoise and jade. Bring your swimmers, because there is a beautiful beach below that will be calling your name. If you have some wheels, then venture a few kilometres to the main pueblo for some more authentic and cheaper dining options. It’s never too early for burritos, so head to Burrito Amor for quite easily the best breakfast burrito of your life. Walk off your food baby and wander around the town for some Mexican souvenirs to take back home. Head back to your digs and have some hang time in a hammock. Holidays are just as much for relaxing as they are for exploring, after all. Most hotels will let you wander in, just make sure to at least order a drink from their bar. If you are a connoisseur of ceviche, then beeline to Mamasan for a light lunch. They serve the prettiest and tastiest ceviche on the coastline along with ridic tacos and tostadas with a twist, with all the ingredients coming from the local region. The stylish space will have your Instagram followers incredibly jealous. A secret slice of paradise is Kanlum Lagoon located 15 minutes from Tulum. It is a spectacular lake with a rustic wooden jetty jutting out over the turquoise green and blue water below. There is a 20 peso fee to enter the lagoon, though a lot of local families hangout here due to the safety of the waters, so be ready to share the space. Picture a disco ball among the palms, fairy lights hanging above, unique and rustic furniture and food to die for. Gitano’s is dining with a difference and will transport you to some kind of jungle wonderland. You can opt for a Mezcal tasting or just try one of their signature-handcrafted cocktails and before you know it the disco ball will have you dancing. If you want to carry on into the night, head to Papaya Playa that boasts a double-decker bar overlooking the beach and a dance floor on the sand below. If you are lucky, you could time it with one of their famous Full Moon parties. Sundays are usually for sleeping in, but not when there are cenotes to see! Get up early to visit these natural gems that are a dream for snorkelling and scuba diving and unique to the Yucatan Peninsula. Cenotes are created when the limestone collapses, creating somewhat of a sinkhole in the ground. There are literally hundreds in the Tulum region and most are joined by underground waterways; the most popular being the Grand Cenote, Dos Ojos and Ik Kil. After all the exploring, it’s time for some brunch. Tunich in the hotel zone has great coffee, ah-mazing omelets and smoothie bowls topped with granola and fresh fruit. They also have good wi-fi if you’re having serious social media withdrawals. Spend your final hours soaking in the sun, getting salty one last time and jotting down the places you want to visit on your next trip to Tulum. ‘Cause trust us, once is never enough. The dry season is from December to April and during this time the prices are higher, the weather is really warm and the crowds are abundant. Rainy season is from June until around October, however we ventured in July and didn’t have one wet day. October to December is a good time to go, as the weather is not overbearingly hot, and the hotels a lot more reasonably priced. Make sure you have sufficient cash as most places don’t take card. There are ATMs around but don’t count on them always having money available or only spitting out US dollars. Scrub up on your Española—locals like it when you give their language a try. Lots of restaurants are open-air, meaning if you are a mozzie magnet make sure to BYO repellant. Be self sufficient with power as Tulum doesn’t have streetlights, much wi-fi and AC is non-existent, so prepare to go without. There is the pueblo (main town) and the playa (beach strip of Tulum), which are about five kilometres apart. Make sure to rent a car if you want to explore further afield, as it’s really safe to do so!